So farewell Interserve. The company, one of the largest contractors to the UK government, has gone into administration at the behest of their shareholders who refused to agree on a debt restructuring deal. A déjà vu? While it’s not yet a repeat of Carillion’s unedifying implosion, the UK faces even more pressure over its handling of outsourced contracts. In an effort to ease fears, the government has sought to assure the public that Interserve’s 25,000 UK staff have a secure future and that its public contracts would be unaffected by the firm appointing administrators. Behind the scenes, of course, will be a furious scrabbling to look at the fallout and impact on its contracts delivering vital government services. If only there were enough information to know. One of the hallmarks of public contracting is the poor state of the publicly available data on contracts and contracting. At the time that Carillion went under, just 28 of their 450 contracts had been made public on the government’s contracting database Contracts Finder. Largely the same is true of Interserve. There are lots of records of Interserve having won framework contracts, contracts that give companies the right to bid for specific jobs from public bodies, but little or no details of the actual, specific work that Interserve has won. Our best analysis of the data, scraped off multiple different websites, shows Interserve’s decline. In 2016, they won 116 public contracts, with a revenue of approximately £9 billion. In 2018 the number of contracts it won shrank by 36% to 74 contracts, and the estimated revenues from those contracts were just £209 million, a reduction of more than 75%. 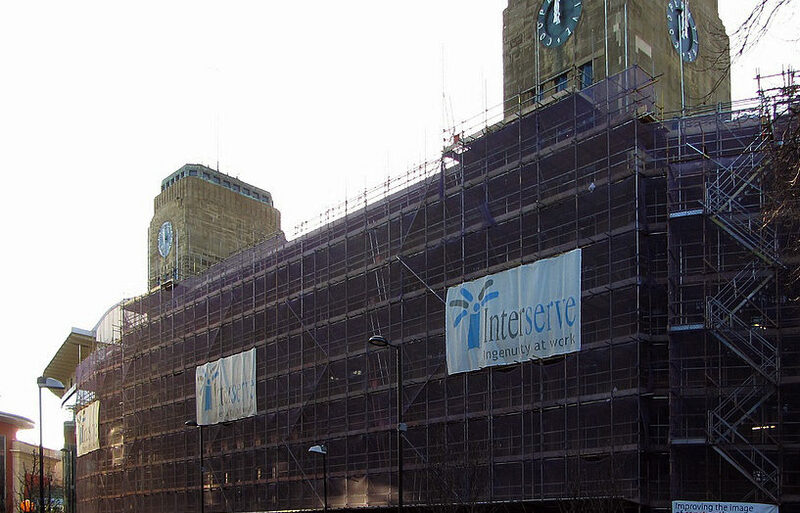 Some buyers have continued to award contracts to Interserve. In 2019, the company has been awarded 11 new contracts worth a total of £232 million. Buyers include The Education Alliance and Highways England both of whom let contracts worth hundreds of millions to the company. There is little information to assess impact yet but one of the company’s largest contracts, with the Department for Transport over £90 million, is meant to run until 2023. A recent Institute for Government report on contracting in the public sector concluded that the poor quality of procurement data was already causing issues for the government but that it also represents a risk: It is critical that the Government, public services and suppliers are reliably able to answer questions about how much is being spent, what is being bought and who the suppliers are. Currently, this is far harder than it should be. Improving government data architecture has a cost, but the cost of inaction will be even greater. Every day, public bodies procure hundreds of millions of pounds’ worth of goods, works and services. The lack of freely available, open data is also a problem for the government itself. With better data and a clearer picture, public bodies can better validate the position of troubled suppliers, they can act faster to protect themselves from unstable companies and they can use the data to find new, challenger suppliers. Good data on public contracts also makes it harder for businesses to represent a rosy financial picture when the reverse is true. As the single biggest area of government spending, at some £284 billion a year, we can’t afford to go on like this. At the moment, 23% of public contracts are awarded after only one bid has been received. This lack of competition has been shown to create poor value for the public purse; better data can be used to drive up competition for public contracts and deliver better services. The government has started to publish procurement data using the Open Contracting Data Standard, a global best practice schema to publish useful data on public contracting. While this has been a welcome development, it has been limited in its roll-out so far and the underlying data remains both incomplete and frequently of poor quality. That transparency needs to extend to the outsourcing operations too. The Information Commissioner noted an alarming transparency gap between public services and the private companies delivering them. If the service is delivered by a public body, then freedom of information laws apply. If they are delivered privately, FOI may not, especially to subcontractors. This matters, for reasons that are particularly clear in one alarming case, where information was not made public about fire safety defects in a private finance initiative hospital. Importantly, transparency isn’t a niche concept anymore, supported only by transparency nerds and policy wonks. Suppliers also think it is a good thing. So much so that Rupert Soames, CEO of Serco, one of the largest government suppliers of public services has openly called for improvements. And academic studies of public tenders, show a clear correlation between the amount of information published and cost reductions. It’s kind of obvious really, the more open you are about what you want, the more likely you are to attract offers of help. The UK needs a reboot of its public contracting. In Slovenia, there’s a law that states that any contract that all public contracts are invalid unless and until they have been made public. It is time we did the same here. For all this to happen the government has to create better open data, but also to use that data with a meaningful purpose. Roll on the open contracting revolution in the UK.